The kit, and the caboodle. The benefits of a truly integrated system. Orders from all channels reside in a single consolidated order file. A single sales order can have unlimited numbers of ship-to’s. During order entry, the product is committed to the order real-time. 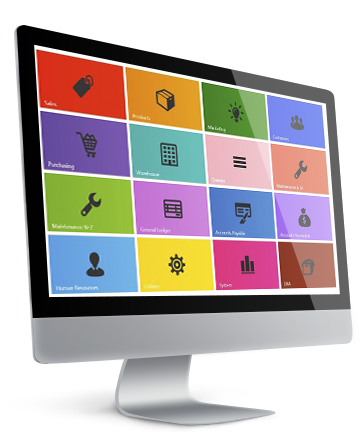 Find products and related information quickly from the sales order. Powerful search capability allows rapid access to customer records. Multi-company / facility / warehouses are fully supported. Easily change the default ship method per shipment on the order. Use of promotions is fully integrated into the order process. The classic Amazon Fulfilled By Merchant (FBM), shipments are done from your warehouse. Fufillment By Amazon (FBA), in which Amazon directs what Amazon locations should receive product, and shipment are done by Amazon. Post products and pull orders for shipment from your warehouse. Planned integration with Walmart being added for 2017. Import orders for Sears for shipment from your warehouse. Handle orders from virtually any channel with custom integrations, such as Linens N Things. Integration originally done for three divisions of our largest customer, Distinctive Apparel, expanded to five divisions due to acquisition in 2017. 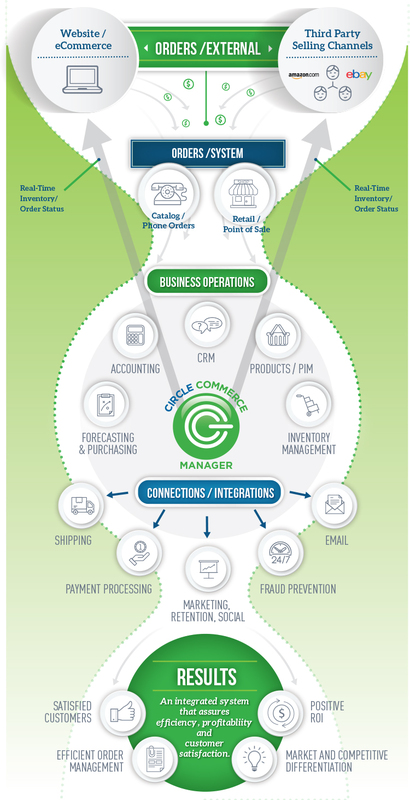 Circle provides product/PIM support and full order integration. Integration done for product/PIM and inventory upload and order download. A less expensive system, but very functional, aspdotnetstorefront orders can be downloaded into CCM for processing. This integration for pulling orders from BvCommerce is being considered for 2017. Circle has done a number of custom integrations with inhouse systems, using our existing SOAP or REST based APIs. Full integration with both domestic and international, supporting ground and express. Full integration for domestic support of all ground and express services. Supporting all USPS shipping methods, and address verification. Ontrac supported on the West Coast, others under consideration. The classic Paymentech integration to the Salem platform using the 120 byte spec over VPN. Access to a separate Paymentech system via the Web, no hardware required. Deep integration with Vantiv (formerly Litle), offering additional Vantiv products. The classic online authorization tool, often used with ecommerce platforms. Formerly Nova in another life, now using the Converge gateway. New implementation in 2017 to support UK customers. Supports POS environments for secure debit card support. EMV support for card present environments. Customers using InfoGroup can have customer data merged with overlays of demographics and get NCOA updates, and access prospects files from lists rented from other sources. Segmentation for catalog mailings is also available. Customers using Datamann can have customer data merged with overlays of demographics and get NCOA updates, and access prospects files from lists rented from other sources. Segmentation for catalog mailings is also available. Leveraging the tools already present for other marketing services, Circle Commerce can readily interface to any marketing service desired. An interface to Kount is being bulit for delivery in late 2017. Additional fraud interfaces are being considered, and can be integrated readily. Find out what drives CircleHub.